The most important point in financial planning is that one must start early. A small amount invested over a longer period will have a big impact on one's portfolio. 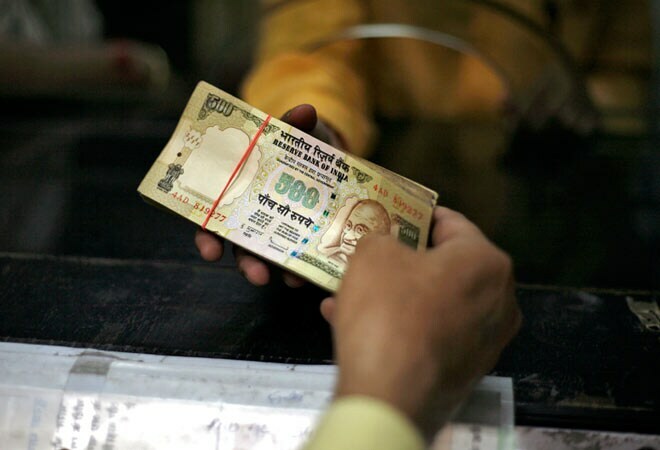 It cannot be compensated even by doubling the investment," says an expert. Creating a financial plan is not rocket science. You just have to put in some time and effort to ensure that the right ingredients are in place. Here is a guide to make sure you stay afloat financially during the worst of times. The most important point in financial planning is that one must start early. Consider this example: Rahul and Samir have been friends for a long time. They are of the same age. Rahul started investing Rs 10,000 every month at the age of 25 while Samir started at 35. At 55 years of age, when both plan to retire, Rahul's corpus would grow to Rs 2.27 crore assuming returns of 10 per cent a year while Samir would have just Rs 76.50 lakh. "This is the power of compounding, the eight wonder of the world," says Nirmal Rewaria, Head, Financial Planning, Edelweiss . "A small amount invested over a longer period will have a big impact on one's portfolio. It cannot be compensated even by doubling the investment," he says. However, not all youngsters are in the mood to save when they start their career. Their pay cheque may not be fat, but they do not have many responsibilities at this stage. That is why the urge to spend is high considering that they are tasting financial independence for the first time. According to a report by HDFC Life , young Indians (in the age group of 20-30 years) score low on financial awareness and planning. While this does not point to a complete absence of planning, this shows they are not fully aware about the merits of goal-based financial planning. They do not realise that this is the perfect time to start building a corpus by investing surplus funds so that they can fulfill all their dreams. Contrary to popular belief, financial planning is for all age groups. While the young have to plan for their entire life, the middle-aged have to ensure they don't fall short of money after retirement. Irrespective of the age, there are some problems we can face anytime. Have you planned for a job loss? Or for that matter a stock market crash that can wipe off a big chunk of your savings? Or an accident that can leave you unfit to provide for your family? Such things are tough to imagine but keep happening all the time. The relevance of a financial plan is fully understood when you start to put your entire future in perspective, emotional as well as financial. According to Rewaria, a financial plan is your life's blueprint. "As long as there are income and expenses, financial planning is for every individual irrespective of age or wealth," he says. The plan should primarily answer three questions. Where you are today, where do you want to be tomorrow and what you must do to get there. "A financial plan helps you deal with the effect of inflation and build a retirement corpus," says Sabyasachi Mukherjee, Head of Personal Investment Strategy at IIFL. "It may also prevent straining of finances during unforeseen events such as medical emergencies," he says. As Robert Kiyosaki said in his book, Rich Dad Poor Dad, it is not how much money you make, it is how much money you keep. There is no minimum amount you need to start saving. You can start with as low as Rs 500 every month, which if invested over the next 25 years could fetch Rs 12.75 lakh at maturity assuming a modest return of 12 per cent. "When you are starting young, there is no thumb rule on the minimum amount you must save for the future. Even 20 per cent of your monthly salary is good enough," says Anil Rego, CEO and Founder, Right Horizons. At this stage, you have no dependants and thus have the flexibility to invest in riskier but high-yielding assets. One can start investing in the equity market through mutual funds as part of a long-term wealth creation plan. Systematic investment plans are a good way to ensure regular long-term investing. It is also a suitable time to begin planning for retirement with help from a combination of investment and insurance products. Start with building a fund for contingencies by keeping two-three months' salary in liquid funds or savings accounts. Buy a term plan with sum assured of seven-eight times the annual salary and an individual medical policy at this stage as premiums will rise as you grow old. This is the day and age of easy credit; hence, it is necessary to stay away from the debt trap. Splurge if you may but don't let the sum of your equated monthly instalments cross half the monthly salary. Financial planning is something that keeps evolving. Take a married couple with a child. Having a child is perhaps the best thing that happened to them. However, couples with children face many challenges, some of which are not even on their radar. While most think about sending their children to best schools and colleges, what often gets missed is the fact that there could be dramatic additions to regular expenses right from day one, including wages to nannies, health care bills and fees for hobby classes. Additionally, there could be a sharp reduction in monthly income if the wife takes a sabbatical. Further, when expenses are adjusted for inflation, budgeted savings are not often enough. A tuition fee of Rs 16 lakh for a two-year MBA programme, for instance, will be Rs 38.50 lakh after 18 years (at a nominal inflation rate of 5 per cent). This does not include boarding and other charges. Further, the need to widen insurance coverage arises once you have an additional member in the family. While the above points are specifically related to children, one should not forget other life events which need attention. These include planning for retirement so that you continue to enjoy your present standard of living in old age and long-term health care costs. "A well-documented financial plan helps in cash flow monitoring, choosing the right investment avenues, assessing insurance needs and efficiently planning for taxes," says Mukherjee of IIFL. A simple way to start would be to have a four-point checklist. The first step should be to keep track of income and expenses through a simple budgeting exercise. "The cash flow exercise helps in reduction of debt, saving efficiently for goals and taking investment decisions," says Mukherjee. It is absolutely essential unless you are among those who have received a seven-figure inheritance. A surplus will indicate that you have extra money to invest while a shortfall will show your liabilities. In short, it will illustrate your financial behaviour and what your future may look like if you stay on your current path. Thereafter, assess your net worth by creating a personal balance sheet, which should include all your assets and liabilities. The investable surplus (derived from your cash flow statement) will allow you to arrive at a target balance sheet in the future. The second step is to identify and prioritise goals. "Identify the goals, how far they are in the future and their cost in today's terms," says Rewaria. As a couple you would need to plan for your child's education, daily expenses, retirement, etc, all at the same time. Though each of these goals may be equally dear to you, a comprehensive plan will allow you to prioritise and invest accordingly. Short-term goals, for instance, are those you wish to achieve in the next six months to one year. Medium-term goals are for five to 10 years, while long-term goals are for periods beyond 10 years. For example, if your medium-term goal is to buy a new car within the next three years, zero in on the car you're interested in and how much it costs. The plan could be based on how much money you will need for a down payment. Then, determine your target purchase date and the cost of the car adjusted for inflation on that date. Making provision for emergency funds and ensuring enough insurance cover for your health and dependents is imperative, says Rewaria. A financial plan helps you to deal with the effect of inflation and build a retirement corpus for the future, besides upgrading and maintaining your lifestyle. Now, make your money work for you, by developing an investment plan. Once you have identified your goals and mapped them to the time horizon, you can develop an investment plan by choosing products that match your risk-taking ability. Let us assume your goal is to save for your daughter's MBA degree from IIM-Ahmedabad. After 18 years, this will cost you Rs 38.50 lakh in just tuition fee. Taking additional expenses into account, the total cost would be Rs 50 lakh. To save Rs 55 lakh, you need to invest Rs 5,000 per month for the next 18 years at a rate of 15 per cent a year. This sum needs to be invested in a diversified equity mutual fund, considering equities are known to give returns of around 15 per cent over long periods. According to Gaurav Mashruwala, Certified Financial Planner, equities is the recommended asset class for any goal that is more than seven to nine years away while debt works for goals that are two to three years away. Anything in the interim could be a combination of both. Last is investment avenues. According to Rego, mutual funds, bonds and public provident fund are most effective ways to implement a financial plan. "However, the investment should be based on one's risk profile and be spread across different assets in order to minimise risk and enhance risk-adjusted returns," he says (See Diversify Your Investments). For Mukherjee, the mutual fund investment route scores the highest in terms of cost efficiency, tax efficiency and ease of execution. There is also the advantage that the money is managed by professionals. A mutual fund can be easily incorporated in a financial plan according to the person's risk-taking abilities and goals. Liquid mutual funds, for instance, offer a high degree of safety and are most suited for contingencies. Income funds may be best suited for accrual income and some capital appreciation while hybrid funds may be used for wealth creation. 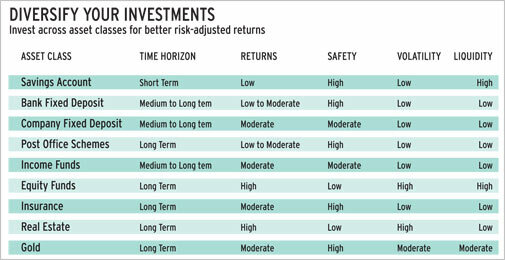 Diversified equity mutual funds, which are actively managed, give an opportunity to earn alpha returns in the long term. For those who have an affinity towards gold, gold exchange-traded funds allow one to purchase gold in an electronic form and benefit from price movements, with the option of converting the units into physical gold at a later date. Mutual funds can be easily bought through banks, brokerages and fund houses. The redemption procedure is also simple. "The last but essential step is to regularly review and monitor the financial plan," says Mukherjee.